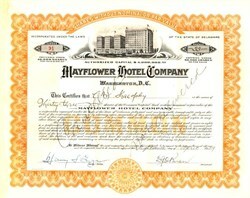 Beautifully engraved Certificate from the Mayflower Hotel Company issued in the 1920's. 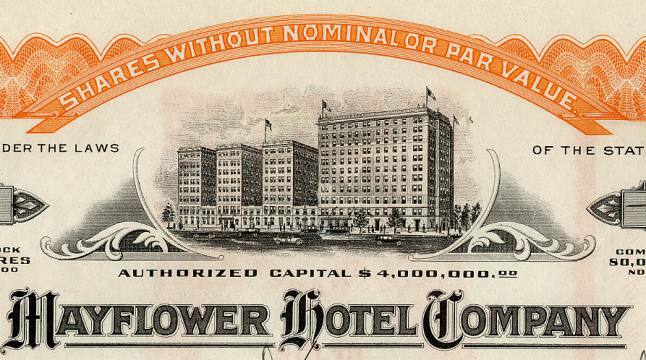 This historic document was printed by the Young and Selden Company and has an ornate border around it with a vignette of the famous Washington DC Hotel cars from the 1920's driving by. This item is hand signed by the company's officers and is over 80 years old. This hotel dubs itself as "Washington's second best address." In fact, the Mayflower attracts nearly as many notables as the nearby White House -- no doubt the town's first most desirable address. Since opening its doors in 1925, the hotel has hosted Calvin Coolidge's inaugural ball and Charles Lindbergh's celebration of his historic flight. Hotel legend has it that during a visit, actress Jean Harlow was so intrigued by the hotel's switchboard that she spent a morning as a stand-in operator. Designed by Warren and Westmore, the New York architects who also worked on Manhattan's Grand Central Station, the original hotel boasted 1,057 rooms, including 112 apartments. Hotel workers reportedly spent three months working around the clock just to arrange some 25,000 pieces of furniture delivered from New York. Extensive renovations in the early 1980s restored the hotel to its original grandeur, earning it a place on the list of the National Register of Historic Places. Furnishings are lavish: poster beds and settees, damask wing chairs, and tiered curtains with matching bedspreads and dust ruffles. Walls are covered with faux-silk wallpaper and decorated with historic prints of local scenes. The bathroom, covered in Italian marble, is luxurious. Light-wood cabinets house an army of fluffy towels. The Mayflower Hotel hosted the Inaugural Ball of President Calvin Coolidge just two weeks after its opening. It hosted an Inaugural Ball every four years until it hosted its final ball in January 1981. It has not hosted an Inaugural Ball since. President-elect Herbert Hoover established his presidential planning team offices in the hotel in January 1928, and his Vice President, Charles Curtis, lived there in one of the hotel's residential guest rooms during his four years in office. Senator Huey Long also lived at the Mayflower, taking eight suites in the hotel from January 25, 1932, to March 1934. President-elect Franklin D. Roosevelt spent March 2 and 3 in Suites 776 and 781 at the Mayflower Hotel before his inauguration on March 4. Two events of significance during World War II happened at the Mayflower. In June 1942, George John Dasch and seven other spies from Nazi Germany entered the United States after being transported to American shores via a submarine. Their goal, named Operation Pastorius, was to engage in sabotage against key infrastructure. But after encountering a United States Coast Guard patrol moments after landing, Dasch decided the plan was useless. On June 19, 1942, he checked into Room 351 at the Mayflower Hotel and promptly betrayed his comrades. Eighteen months later, a committee of the American Legion met in Room 570 at the Mayflower Hotel from December 15 to 31, 1943, to draft legislation to assist returning military members reintegrate into society. Their proposed legislation, the Servicemen's Readjustment Act of 1944�known informally as the G.I. Bill�was put into final draft from by Harry W. Colmery on Mayflower Hotel stationary. Twice, the Mayflower has been the site where a U.S. presidential campaign was launched, and twice it hosted events which proved to be turning points in a presidential nomination. In March 1931, Franklin D. Roosevelt was vying with Al Smith for the Democratic presidential nomination of 1932. John J. Raskob, chair of the Democratic National Committee (DNC), opposed Roosevelt's candidacy. Knowing that Roosevelt had privately committed to repealing Prohibition but had not done so publicly (leaving him "damp"), Raskob attempted to force the DNC, then meeting at the Mayflower Hotel, to adopt a "wet" (or repeal) plank in the party platform. Instead of drawing Roosevelt out, the maneuver deeply offended Southern "dry" (anti-repeal) Democrats�who abandoned Smith and threw their support to the allegedly more moderate Roosevelt, and helped him secure the nomination. In 1948, President Harry S. Truman told a cheering audience of Young Democrats of America at a dinner at the Mayflower on May 14 that he intended to seek re-election in 1948. Former Peace Corps and Office of Economic Opportunity director Sargent Shriver announced his run for President of the United States at the Mayflower on September 20, 1975. Shriver withdrew from the race after a very poor showing, but a more successful campaign began there in 2008. Senator Barack Obama had locked down the 2008 Democratic nomination for President one June 3, 2008. Hillary Clinton conceded the nomination to Obama on June 7, and introduced Obama to about 300 of her leading contributors at a meeting at the Mayflower on June 26, 2008. J. Edgar Hoover, director of the Federal Bureau of Investigation (FBI), lunched nearly every day at the Mayflower Hotel's Rib Room with Clyde Tolson, Associate Director of the FBI, from 1952 until Hoover's death in 1972.Hoover had the same lunch every day: chicken soup followed by a salad of iceberg lettuce, grapefruit, and cottage cheese. Buttered white toast was served on the side. (He brought his own diet salad dressing.) Hoover was so well-known at the Rib Room that he sometimes ducked out through the kitchen to avoid reporters.